Fortunately, last week I had one free day for sightseeing in Tokyo before moving to the conference location in Niigata. It was a tiring but very exiting day in Tokyo. Tokyo offers a very wide range of attractions well worth a visit. After having a look in the internet and asking the hotel staff about the places that they would recommend in Tokyo, I planned my journey through Tokyo to visit 4 key points of interest: Imperial Palace, Ueno park, Ginza, and Ikebukoro. I got the day pass "Tokyo Free Kippu" (1580 Yen) with unlimited use of all subway lines and JR trains in the central Tokyo area on one calendar day. I used the JR Yamanote Line, Tokyo´s most prominent train line which takes a circle line and connects Tokyo´s major stations (Tokyo, Ueno, Ikebukoro, Shinjuku, Shibuya and Shinagawa). I started with the Imperial Palace which is a 10 minute walk from Tokyo Station. The Imperial Palace itself is not open to the public but the Imperial Palace East Gardens which are part of the inner palace area can be accessed. After visting the Imperial Palace East Gardens, I moved to Ueno Park, a large public park next to Ueno station that offers a large variety of attractions. I visited there the Tokyo National Museum and learned more about Japan´s history especially the Edo and Meiji Periods. I also visited the Zoo, Shinobazu Pond, Toshogu Shrine, and the statue of Saigo Takamori who played a key role in realizing the Meiji Restoration of 1868. Then I took the Ginza Subway Line from Ueno to move to the famous Ginza shopping, dining and entertainment district, with numerous department stores, galleries, cafes and restaurants. I visited there the clock tower of the Ginza Wako building, the Sony building and several department stores like Mitsukoshi, Printemps and Seibu. I spent then the rest of the night in Ikebukuro next to my hotel. Ikebukoro also offers a plenty of entertainment, shopping and dining opprtunities. Ikebukuro station is Japan´s second busiest rialway station after Shinjuku Station. I got dinner in a Japanese restaurant, visited some points of interest like Bic Camera Main Store and enjoyed the very crowdy nightlife in the area around Ikebukuro station and Sunshine City. Just came across this post while browsing through Stephen’s blog. Stan Stanier from the University of Brighton has introduced a new concept of “Shared learning Environment”. He writes “the PLE concept focuses on the individual learner. All well and good, but the concept (or perhaps just the name) doesn’t give great emphasis to the fact that individuals contribute to the learning of others…At this point I’m not completely sure whether I’m introducing a new concept here or simply posting a plea for help but it does strike me that there’s a wider entity beyond the PLE and VLE – the idea of sharing learning – helping others in a mutually supportive community to foster learning and encourage participation – to make the whole greater than the sum of the parts – a shared learning environment.” Based on Stanier’s post, Dave Tosh depicts a concept diagram from the SLE model. I would like to discard at the outset two common assumptions about the relation between the individual and the social. that human life is a compromise by which each makes concessions to the other. that the social is the source of harmony and order while the individual is the source of discord and fragmentation. 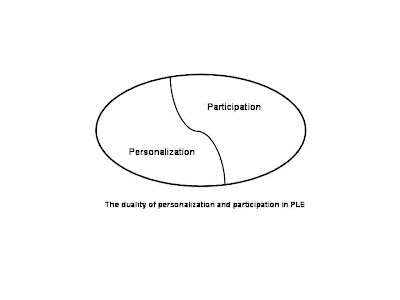 In my opinion, there is no divergence between personalization and participation (the individual and the collective). Personalization and participation cannot be considered in isolation. They complement and enhance each other. They interplay with each other, but cannot replace each other. They form a unity in their duality. We cannot have the collective if we do not assume the individual as a point of departure. And, we cannot have the individual if we ignore the collective since learning and knowledge are social in nature. The bottom line is that the PLE concept doesn’t only focus on the individual learner. It also focuses on the collective so there is no need to introduce a new concept that is basically telling the same. At ICALT last week, I presented our paper "The Web 2.0 SECI Model Based Learning Process". The paper can be downloaded here. Here are also the slides of my talk. Nonaka and his knowledge transformation model SECI revolutionized the thinking about organizations as social learning systems. He introduced technical concepts like hypertext into organizational theory. Now, after 15 years Web 2.0 concepts seem to be an ideal fit with Nonaka’s SECI approach opening new doors for more personal, dynamic, and social learning on a global scale. In this paper, we present an extended view of blended learning which includes the combination of formal and informal learning, knowledge management, and Web 2.0 concepts into one integrated solution, by discussing what we call the Web 2.0 driven SECI model based learning process. M.A. Chatti, R. Klamma, M. Jarke, A. Naeve :The Web 2.0 Driven SECI Model Based Learning Process. Proceedings of the 7th International Conference on Advanced Learning Technologies (ICALT 2007), July 18-20, Niigata, Japan, 2007. Last week I attended the 7th IEEE Intenational Conference on Advanced Learning Technologies (ICALT 2007) in Niigata, Japan. It was indeed an exiting time there. I´ve been once in east Asia when I attended ICALT 2005 in Taiwan, but Japan is somehow different with an amazing mixture of traditional Japanese and modern Occidental lifestyle. I spent the first 2 nights in Tokyo and then moved to the harbor city Niigata one day after the earthquake. The conference was held in nice Toki Messe, Niigata Convention Center. Below are some pictures from my stay in Tokyo and Niigata. In a next post, I´ll write more about my experience there. The gadget is an XML file sitting on your server. In my case, http://ajaxify.com/run/widgets/google/diggroundup.xml. It will get cached, so effectively it must be a static file. Adam Ostrow takes a look at 10 markets where Google wants to win. The author writes "Google is the 600-pound gorilla: the company that no one wants to see build a competing product. Google dominates many of the markets it enters, whether by building a superior product or acquiring one". Yesterday, Nanda Firdausi Muhammad successfully defended his master thesis "ALOA: A Web Services Driven Framework for Automatic Learning Object Annotation". Under my supervision, Nanda has designed, implemented, and evaluated a Web Services driven framework for IEEE LOM compliant automatic matadata generation. The primary focus has been on the flexibility and extensibility of the framework, such that new metatata generation services/modules can easily be plugged into the basic system. The proposed solution and the implemented system fulfill these requirements; the system already implements different modules and is capable of generating a big part of the LOM metadata from different types of learning objects (e.g. HTML, PDF, PPT, Word). The goal of flexibility was achieved as the system provides a public Web Services API that can be used by third party applications and has a SOA based architecture that makes it possible to extend the framework with new components. The main components of ALOA are Extractors and Generators. An extractor is responsible for extracting text information from a learning object along with more properties about the learning object. Only one extractor can be defined for each learning object type e.g. html, pdf, ppt, word. A generator is responsible for the actual metatada generation. It uses the output of an extractor and applies data mining techniques to generate one or parts of the metadata. Everyone should be able to easily create a new extrator/generator and plug it into ALOA via the admin interface. A detailed documentation on how to implement a new extractor or generator is available. Please do not hesitate to contact me if you would like to create your own component/service/module or need more information about the ALOA framework. This thesis was a successful cooperation between Informatik 5, RWTH Aachen University and the computer science department of the Katholieke Universiteit Leuven in the framework of the EU Network of Excellence PROLEARN. Try it out! Your valuable feedbacks, suggestions, comments, and ideas are welcome! Learning and knowledge are social, personal, flexible, dynamic, distributed, ubiquitous, complex, and chaotic in nature. We need thus to rethink how we design new models for learning and knowledge management (KM) that mirror those characteristics. The table below illustrates seven critical factors that must be addressed to ensure that future learning and KM models will endure. In the modern media and knowledge-intensive era of collaboration culture, the one-size-fits-all, centralized, static, top-down, and knowledge-push models of traditional learning and KM initiatives need to be replaced with a more social, personalized, open, dynamic, emergent, and knowledge-pull model for learning and KM. Learning and KM models need to recognize the social aspect of learning and knowledge and as a consequence place a strong emphasis on knowledge networking and community building to leverage, sustain, and share knowledge in a collaborative way. Recognizing that learning and knowledge are personal, learning and KM approaches require a move away from one-size-fits-all content-centric models, and move towards a user-centric model that puts the learner/knowledge worker at the centre and gives her the control. Learning and KM solutions need to operate with a more decentralized and socially open approach, based on small pieces, loosely joined and distributed control. Learning and KM solutions need to follow an emergent bottom-up approach, driven by the learner/knowledge worker and based on sharing rather than controlling. Recognizing that learning and knowledge are dynamic and flexible in nature, learning and KM approaches require a shift in emphasis from a knowledge-push to a knowledge-pull model. For learning and KM approaches to be adopted, their systems need to be both simple and useful (high Perceived ease of use PEOU and Perceived usefulness PU). A bottom- up approach and distributed control build a base for successful knowledge sharing and trust. Encouraging people to build their personal social networks and join communities based on their needs helps to ensure trust and motivates them to share. Chatti, M. A., Jarke, M. and Frosch-Wilke, D. (2007) ‘The future of e-Learning: a shift to knowledge networking and social software‘, To be published in the International Journal of Knowledge and Learning IJKL 3(4).